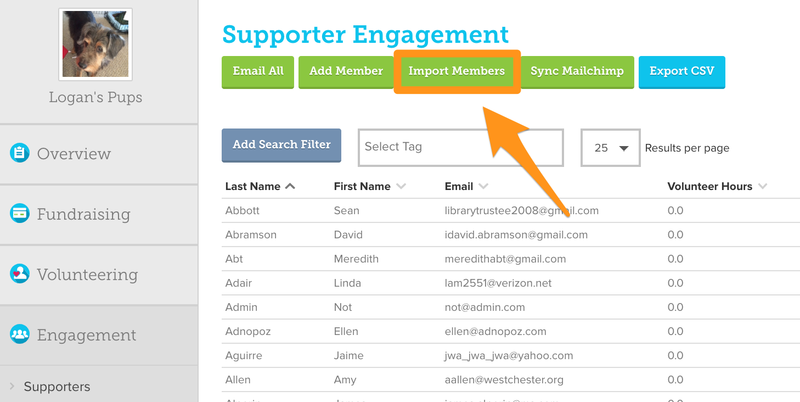 Once on the "Supporters" Dashboard, click the "Import Members" button to begin adding your supporters to GiveGab. Click on the white "Choose File" button to and select the CSV file from your computer. Next, press the "Upload" button to upload the document. Your CSV file must include the supporter's (1) first name, (2) last name, and (3) email address in that order. Click blue "Upload" button and you should see a green check mark saying the CSV file has been added successfully and that your supporters have been added to GiveGab!